Ade Jackson and Neil Finegan were the sole Helsby representatives at St Helens and Ormskirk Parkruns respectively while Louise McEveley, Paul Gillard, Ste Wiggins, Paul Bulmer, Clare Morton, and Helen Gillard turned out at Delamere. On the same day was the 20 mile time trial kindly organized by Colin Thompson to help people with their spring marathon training. The result are below and special thanks go to Louise Spruce, Jo Farwell and Carol Shaw for helping out with the timing, marshalling and tail running duties. Cheers!! 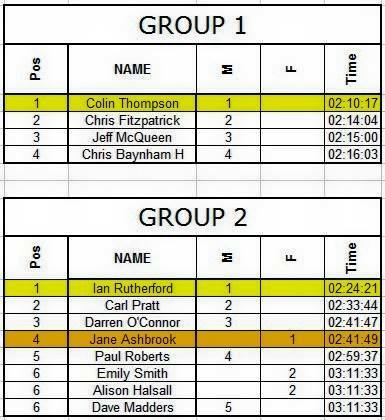 Also on Saturday was the Masters Cross Country at Ruthin where Colin Bishop secured second place in the V55 category. Well done Col!! 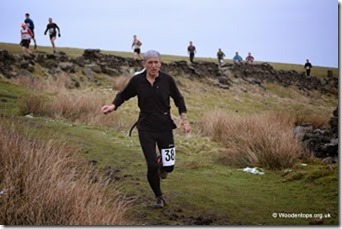 Jackie Keasley kindly sent in the following report from the Haworth Hobble Ultra. 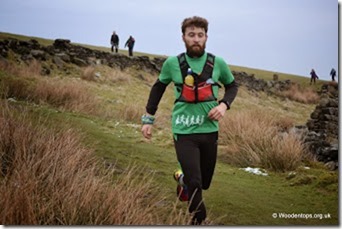 “Saturday was the first race in the Run Further Series; remember Andy Robinson’s talk just after Xmas advertising the Ultra series Andy helps organise?! 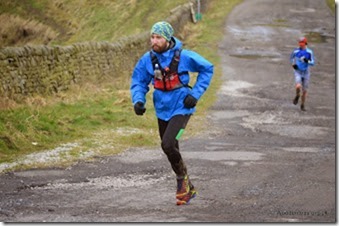 Inspired by his enthusiastic talk, the opportunity of running around parts of Yorkshire and even Lancashire I have never been too, and it being one of the shortest races in the series, a mere 32 miles, I entered! Its simple to enter, just click that button and pay the price, a bargain £13 for a full day out with food & drinks all inclusive!!! 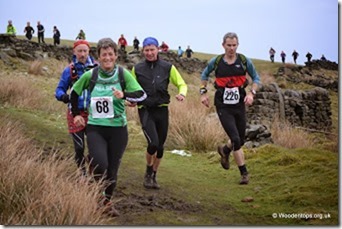 A long March race was always going to be difficult particularly with going away on holiday for 3 weeks in Feb and before good conditioning races like Coniston 14 to start the legs rolling. After 4 hours sleep,( Friday was the CWAC awards in Chester), I met Andy & Max in Frodsham at 5am. A fast journey over the Pennines with the temperature gauge hovering between 1 degree C and zero on the approach to Haworth. The skies were overcast but the moors were mist free which was a relief. Time for coffee and museli bars before putting on warmer clothing and lining up at the bottom of the steep cobbled Haworth main street. A parade through the deserted town and onto the moors towards the flagstoned Pennine Way. Past a succession of reservoirs and wind turbines on good gritstone tracks, followed by a cross country type muddy section. We dropped steeply down stepped pathways (that looked like entering someone’s private garden) into Hebden Bridge. Past Mankinhole YHA and up to the imposing Stoodley Pike before starting the roller coaster part of the race with steep drops through woodland and cobbled roads into the Calder Valley. Then straight back up again to Hepstonstall, straight back down again to Horse bridge then up again to onto the high open moors. Then, having completed a marathon it was a mere 6 mile undulating high level track back to Haworth. Amazing running by Max to secure 23rd place in a field of the country’s top ultra runners; Marcus Scotney & Jez Bragg in 6th & 7th place says it all! (quote from Andy) . Despite running with a broken wrist Andy finished in 112th place, having fallen 3 times, each time managing to role onto his good side. I came 264th out of 390 runners. Highlights – The check points along the way were amazing; freezing cold water (suspect stored in marshall’s cars overnight) but plenty of hot drinks, hot dogs (no thanks! ), doughnuts, posh biscuits & even whisky (no thanks again)! I was expecting to be at the back of the field navigating all day as the route was not flagged. But there were runners around me all the race and a majority of them had done it before so were worth following especially passing through the towns and villages en-route. It was worth mapping the route out in advance (thanks Andy for taking Max and me through the whole route last Wed eve) but in the end didn’t look at the map once! It was comforting to know that at the back of the field there were a few walkers too with an 11 hour cut-off time. Thanks for the report Jackie. Just a couple of announcements to finish off with. This Sunday is Race 5 in the Border League with both the mens and womens teams doing very well in their divisions, the race is held in Mold and good turn out could really set up an exciting climax to the season with 3 races left so please attend if at all possible. Also, the following reminder from Jackie. I know its mid-week but for those who can spare the time, it would be great to have some green army presence at the meeting, so please wear your club hoody. The plan is for some Helsby Runners to run from the Helsby Clubhouse to attend the meeting in Chester and we’ll get the press to record the “Green Army” assault! We need to be at the Chester HQ at 3:30, so for those who want to run the whole distance, meet at the club at 2pm. For those who would like a shorter option (4.5miles), meet at the layby on the main road in Mickle Trafford (just before Dee Road goes off right) at 2:30. From Guilden Sutton we will take the greenway into Chester. Bill will be able to take our kit from the start into Chester and supply drinks. There will be enough cars available to give lifts back to Helsby after the meeting.